The purchase of candles is a small offering to God and the proceeds help support His temple. It is an offering that is voluntary and easy. Therefore it is preferance to obtain a candle in the temple where one comes to pray. The size of the candle is not important - each offering is pleasing to God. Candles should be offered before the beginning of the service. It is sad to see how many people come to the temple late, even during the most important and solemn moments of the Divine service, and place candles, disrupting the order in the temple and distracting other believers who are concentrating on offering gratitude to God. If a person is late they should wait until the end of the divine service and moreover, should place a candle in such a way that it is not disruptive to others. Candles can be put any place in the temple. When lighting a candle it is not so important where or how you place the candle. What is important is your spiritual mindset – feelings of love and gratitude to the Lord for all His great blessings towards us, the heartfelt repentance for sins, out of the love for the saints imploring their help, out of love and caring for those living and reposed for whom we offer prayers before the Lord. “I desire mercy, not sacrifice (Matt. 9:13)” - says our Savior. Therefore the lighting of candles should not be considered a formal sacrifice returning what is due to God, but a display of our love and nearness to Him, a prayerful request before God. 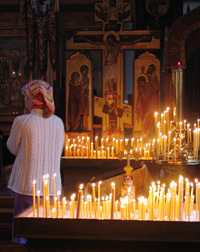 Candles can be placed near an icon of the Savior, the Virgin or a saint, depending on whom you are addressing with your prayer. By church tradition candles for the reposed are placed before the crucifix (usually in a candle stand in the form of a table with a set of individual holders or simply a box filled with sand). If there is no icon of the saint to whom you wish to address your prayer, or there are many people in the temple and the candlestick next to your icon is full, you can place your candle anywhere. Do not be concerned if candles for the health and well being of the living and reposed are place in the same area. Before God all are the living and reposed. Those who have just left the visible world are in a different world. What is important is your prayerful request before the Lord. It is a sin to deliberately offer candles with a harmful intent for a person now living or reposed. 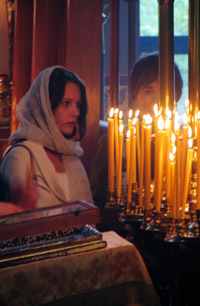 According to tradition a candle is first placed for the holiday or feast being celebrated, then for the temple icons, then before relics of saints if such are present in the temple, then for your namesake (the saint after whom you are named) and then for the the health of the living and memory of the reposed. The accepted practice is to first pray before and venerate the icon in front of the candlestand, before placing the candle. If the candle is being placed for the reposed you can offer a prayer such as: “Remember O God, Thy servant (name), and forgive his/her sins, voluntary and involuntary, and grant him/her Thy Heavenly Kingdom.” For concerns about health or some special need, candles are usually offered to the Savior, the Mother of God and often to the great martyr and healer Saint Panteleimon, or to a saint to whom the Lord granted the special providence to cure illness and give help in various needs. Having placed your candle you can say: “Holy God-pleaser (saint's name) pray to God for me, a sinner (or the name of someone you are praying for)". Light the candle from one already burning and if needed soften the bottom and place it in a holder of the correct size. 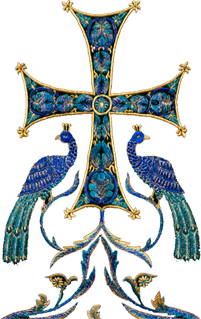 The accepted practice to venerate an icon is as follows: Cross oneself and bow, twice; kiss the icon; then cross oneself and bow again. 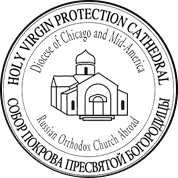 It is improper to kiss the face of the image represented by the icon. If visible, one should kiss the feet or legs. If not visible, one should then kiss the hands. If feet or hands are not visible, such as on the icon of the Savior "not made by man", or of the head of Saint John the Baptist, one should kiss the edge of the hair. In no event is it permissible for women to kiss an icon or cross when wearing lipstick. Candles are extinguished when they have burned to a height of approximately 2 to 3 inches. The candle ends are collected and sent to a church candle factory, where they are used to make new candles. After placing their candles, believers choose a place where they wish to stand and pray, and do not move around during the Divine service. It is an ancient custom that men will stand on the right side of the temple facing the alter and women on the left.